Little less than halfway through the 2011 NASCAR Sprint Cup season, drivers and teams return to where this unpredictable year started. The Saturday night running of the Coke Zero 400 comes in a race schedule stretch that has run on a 2-mile oval and a 1.98-mile road course. the 2.5-mile Daytona International Speedway sends the Sprint Cup teams back into the perils of restrictor plate racing. Drawing the 40 spot of 45 cars making a qualifying run, Mark Martin and his #5 Carquest/Godaddy.com Chevrolet overcame 2011 Daytona 500 winner Trevor Bayne to take pole. The Chevrolet Impala lapped the speedway with a speed of 182.065 miles per hour. Guaranteed to be a aggressive show, the 43-car field for the 400-mile, 160-lap Coke Zero 400 was sent underway with the likelihood of expecting the unexpected. Starting 3rd in the Coke Zero 400, Trevor Bayne’s fairy tale win in the Daytona 500 was not going to be repeated in this 400-mile July event. On lap 5, the #2 Miller Lite Dodge of Brad Keselowski had bump drafted the #21 Motorcraft Ford through turn 1. Sending the #21 of Bayne sideways, the Ford would pound the outer wall destroying the stock car’s front end. Slowing down for the accident, the #11 Toyota was into by the #1 of McMurray. Bayne and the Wood Brothers team were rendered too damaged to continue the Coke Zero 400 after running only 12.5 miles. As soon as the green flag started the Coke Zero 400, drivers reformed into the two-car tandem drafts with prearranged partners. For Hendrick Motorsports, the #48 of Jimmie Johnson and the #88 of Dale Earnhardt Jr began working together while Jeff Gordon’s #24 Chevy partnered with the pole sitter Mark Martin. 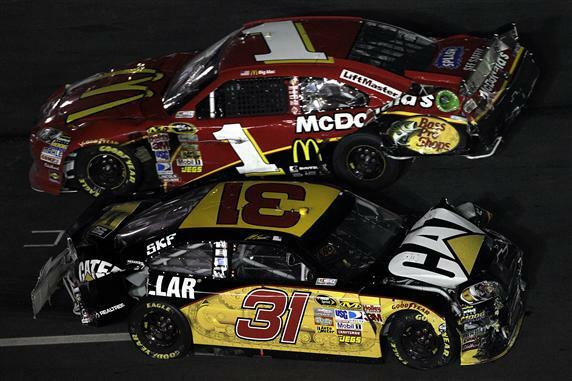 Other teams including Richard Childress Racing and Red Bull Racing quickly adapted this trend within major organizations. Supported by a push from Jeff Gordon, the pole-starting vehicle of Mark Martin stayed up front through the first 16 laps of the event but only eventually overhauled for the leading position for one of race leaders in the Coke Zero 400. From lap 16 to lap 150, the front spot was so heavily contended that no driver was able to lead more than 8 laps for a single period. Carl Edwards was among the early leaders of the event at Daytona International Speedway. Leading for lap 19, fortunes shifted quickly for Edwards and the #99 Ford just 5 laps later. Impacted by teammate Greg Biffle driving the #16 Ford, Edwards was sent sideways in turn 4. Almost missing the inside wall, the #99 Ford did make contact with rear and side damaging the stock car’s crush panels. The Roush Fenway Racing team was able to repair the #99 car, but were only able to muster a 37th place result at the end of the event. At the Coke Zero 400’s halfway point, the Red Bull Racing team showed wings at Daytona in the top two spots. Kasey Kahne led with Brian Vickers’ #83 Toyota tucked behind the #4 teammate. Joe Nemechek, Travis Kvapil and Casey Mears rounded out the top-5 at lap 80. By lap 99, every car had attended pit road under green with Clint Bowyer assuming the lead. Martin Truex Jr in the #56 NAPA Toyota swept to the lead on lap 100 with Kyle Busch’s #18 car taking the top spot a lap later. With pit stops performed under green, the field continued caution-free for 106 laps. With three laps remaining as drivers and engines were running hot, a pack of 14-cars was beginning to size up their competition for what could be a run to the checker flag. However, as the Sprint Cup vehicles charged into turn 4, the #4 Toyota slid up the race track after receiving a misplaced bump from the #83 of Brian Vickers. Kahne kept control of his Red Bull Toyota but the chain reaction caused squeezed the #18 of Kyle Busch into the minor contact with the Daytona outer wall. Most dramatically in the melee, the #24 Chevrolet of Jeff Gordon was sent sideways but was able to avert any serious damage. On the first restart, Joey Logano attempted to make a move on the inside of Martin but found his passing lane was narrowed as the #20 Toyota approached the #83 car running the lower lane. 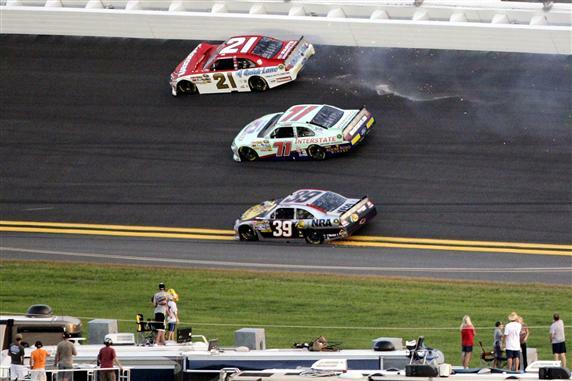 With no room for three-wide racing, Logano ended up clipping the #5 Chevy causing the Coke Zero 400’s big wreck. The #5, #13 #22, #38, #56 and #78 were all among cars collected as cars crashed out of turn two. Lining up for a second run to the checker flag, David Ragan and Ryan Newman took formation for the restart. Newman was quickly sorted out of the front as Ragan’s teammate in the draft Matt Kenseth pushed the Ford Fusions by the Chevrolet. Down the backstretch for the final lap, David Ragan and Joey Logano were being propelled by respective pushers to the Coke Zero 400 start/finish Line. However, as those drivers competed for victory, 5th place and back came a perfect storm for a contact-filled last few corners. In turn 3, the #51 of Landon Cassil and the #9 Ford of Marcus Ambrose made contact. Diving the big wreck on the green-white-checker restart, Dale Earnhardt Jr would be unable to escape chaos on the second run to the start/finish line. Running in the lower groove of the pack, the #1 Chevrolet of Jamie McMurray came down on the right front quarter panel of the #88 National Guard Chevy forcing Earnhardt Jr onto the apron. Incapable of preserving the 190 mile per hour speed on the dirty part of the race track, the #88 car careened back into the pack wrecking cars that included #1 Chevy, the #31 Chevrolet of Jeff Burton as well as the #83 Toyota of Brian Vickers. Earnhardt Jr ended the race in 17th place for the Hendrick Motorsports team. The #88 Chevrolet’s result was actually an improvement over poorer finishes at the last two Sprint Cup series events at Michigan and Infineon Raceway. 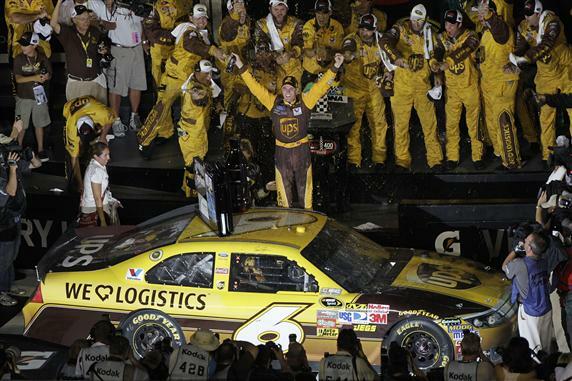 Racing to the finish, David Ragan crossed the line first in the #6 UPS Ford for the driver’s 1st ever Sprint Cup victory. Enduring 163 races, this Daytona victory will undoubtedly defend the 25 year-old’s presence in the top stock car racing series. Ragan’s previous career-best at Daytona International Speedway was 5th scored on two occasions. Pushing his teammate Ragan, Matt Kenseth in the #17 Ford finished 2nd in at Daytona continuing a 7-race streak of finishes 14th or better. 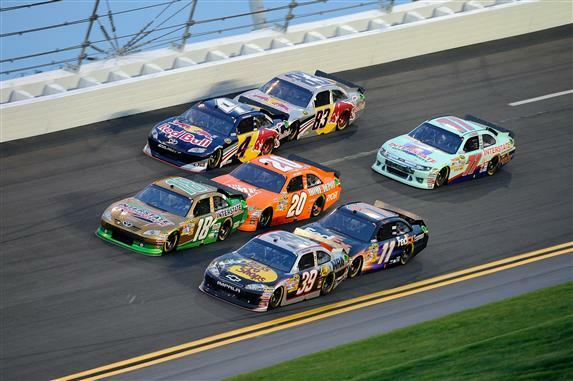 With Ford Fusions taking the top-2 spots in the Coke Zero 400, Toyota drivers Joey Logano, Kasey Kahne and Kyle Busch obtained the 3rd through 5th place positions. Making a hard charge in the late stage of the race, Jeff Gordon finished 6th ahead of Richard Childress Racing cars Kevin Harvick and Paul Menard. Due to Carl Edwards’ trouble-filled Daytona event, Kevin Harvick has assumed the top spot in the 2011 NASCAR Sprint Cup Series points after 17 races. Five points ahead of Edwards, there is an additional five-point gap to the third place driver Kyle Busch.